This Mommy and Me duo were scheduled to be an outdoor session, but due to unfortunate spring rain and rescheduling to a car accident (they are fine!!!) – we moved the session into my studio. Despite it all, how beautiful are these two? The relationship between these two just makes my heart melt! I love how her daughter stares at Mom with such intensity and LOVE. And that kiss…lick? Baby smooches are the best. This photo session couldn’t have gone any better. It has been so special to photograph mama’s maternity photos, fresh 48 photos, and now mommy and me photos for Mia’s first birthday. If you are looking for a family photographer in the Northern Virginia area, I would love to work with you. Family photos should be reserved 2 months in advance, further out if during peak times of spring or fall.] Please contact me for specific availability and a free consultation. Talk about a photogenic pair! Mommy and her little man have such an amazing bond. Taking their Mommy and Me photos in front of the Cherry Blossom trees on a beautiful spring day was such a joy. Connor is such a smiley happy baby, it was so easy to take his photos. He definitely has his mommy’s smile. Enjoy a free Valentine’s Day coloring card from Jamie Romaezi Photography! Last year I designed custom cards for my son to share with his friends for Valentine’s Day. He wanted his friends to be able to color their cards in themselves. It was quite the hit and easy to do from home so I thought I would share this idea and FREE DOWNLOAD for a printable coloring card with you! – Letter sized (8.5 x 11 in) card stock. – The ability to print from your computer, tablet or phone. – Click the “Free Download” link below. – Simply load your printer with your paper of choice and click print. – Remember to print enough for your child’s whole class! – Cut cards along the dotted line. – Consider purchasing a pack of crayons and taping them to the back of the card with scotch or (bonus points) colorful washi tape. – Last year my son was into melting and molding crayons, so that’s what we did! It was a fun activity! Feel free to share the link to this template with your family and friends! 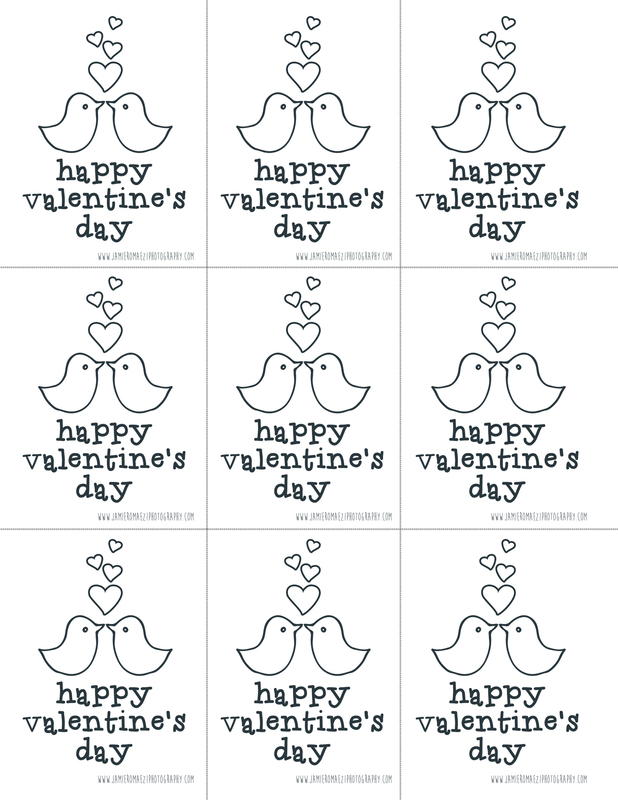 Download Your Free Valentine’s Day Coloring Cards Here!